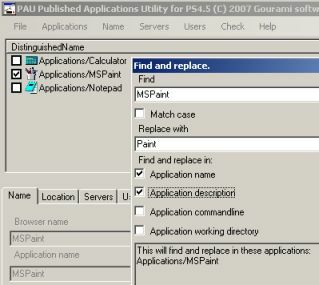 The installation of PAU is one single executable per CPS platform. 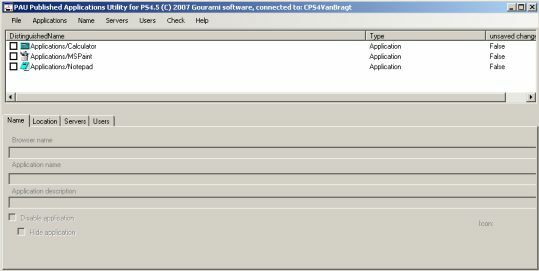 In other words there is separate installation executable for CPS4.0 and CPS4.5. For CPS4.5 HRP1 is required. Earlier versions are not supported. The installation process is actually just copy-ing the files to the directory and creating the (indicated) shortcuts. The installation need to be performed on a Windows 2003 Server with .Net Framework 2.0. Logically the server need to be a member of AD domain and a the account starting the application need to have full administrator right in CPS4(.5). The product is freeware, but registration is required to receive the registration code to use the product. After registration and entering the registration code, you can start using the tool. When you start PAU the tool will read (using MFCom) the datastore for the information stored about Published Applications and displays the data in the tool. In other words you are not directly editing in the data store. Changes made to the Published Applications need to be pushed via the Save Changes function in the file menu. As already mentioned in the import/export PA article PAU can be used to back-up your Published Applications. This is done using the Application option in the menu. Via the Save Application option per application a back-up file is created, while via the Load Applications the settings in the file can restored again. But PAU can be used for much more changes to your Published Applications. With the Find and Replace button you can search for a string (Case Sensitive is possible) in the fields Application Name, Application Description, Application Command Line and/or Application Working Directory and automatically replace that string with a new value. Unfortunate this is the only solution to change these parameters; you can not directly edit those settings. In the same top menu Name there is also the possibility to disable and hide the applications. Within the servers menu option you can add or remove a server (or servers) to or from the selected applications. In this way you can easily remove or add a server to a set of Published Applications. In the menu there is also the option to save a server list. 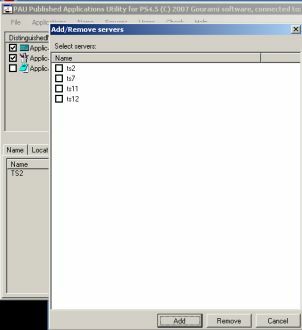 This saved server list can be loaded again within another application. In this way you can add a group of servers to a Published Application based on a kind of template. Just in a similar way you can add or remove servers in PAU, you can also add or remove user groups to the selected applications. When you want to add a group the Active Directory structure is displayed and you can select or search the groups within the forest. When you would like to remove a group or groups all the assigned groups of the selected applications are displayed which can be checked for removal. At last this menu item offers the possibilities to export all the user groups into a CSV file and to see a summarized list of which groups have been assigned to which application. New in this 1.4 release is the possibility to change the shortcut presentation, client options and the appearance of the Published Applications. In my opinion it is a good move to more editable settings (hopefully more will follow). Also in this release a option is build in to select which Published Applications you would be written out of the datastore if you have more than 50 Published Applications available. For most features of the product you need to select the Published Applications. PAU has a nice feature available for selecting those applications via the Check menu. Options are check all, none, inverse or search. The last one is pretty powerful you can search on a string in the distinguished name, users and groups. When you are finished with changing the properties of the Published Applications you must apply those changes back to the datastore. This must be done via the File Save Changes option. The changes are then written to the datastore. To ensure you do not write changes accidentally to the datastore several checks are build in. If you end the program without saving changes to the datastore your changes made are lost, the program does not remember the changes which are not saved. With PAU you can do more than easily create back-ups of your Published Application settings. Beside this import and export function PAU offers functionality to easily add or remove servers and users via different ways. Also settings can be changed based on several application settings some with enhanced with a search and replace functionality. Also the tool has a nice help available (which sometimes is missing in a freeware product). The flexible selection methods of the Published Applications and the method do not directly write changes to the datastore are advantages of this utility. Personally I would like to have the option to change more settings manually so I can use the tool for all the aspects of managing Published Applications.